Sacred Geometry may be popular online, but the natural world favors certain shapes for a reason. Believers in sacred geometry ascribe power and significance to naturally occurring shapes. They see them as evidence of organization — likely by a higher power. Within this small group, there is a smaller group obsessed with hexagons. There are entire online communities dedicated to literal and figurative hexagon worship. There’s even something called Hexagonal Awareness Month. Phrases like “transcendental hexagonal future” get tossed around. For anyone who found geometry class less than spiritually enlightening, this is all a bit much. But the underlying belief is not as absurd as it may sound. Hexagons are startlingly omnipresent in nature and their properties are somewhat awe-inspiring. Still, we can explain much of the hexagon’s natural recurrence without resorting to religion. Let’s start by taking a little tour of hexagons in nature. This jaunt may ignite that part of your brain that makes you wonder whether there might indeed be something over and above yourself. We’ll start big and work our way down. But this is no ordinary cloud formation: it’s a very distinct hexagon. Each of the hexagon’s six sides is bigger than the Earth’s own diameter. Scientists have put forth a handful of hypotheses about its cause — for instance, if you spin a bucket of water fast enough, the whirlpool turns into a hexagon — but it remains largely a mystery. Back on Earth — well, in California anyway — there’s something known as the Devils Postpile. Fewer than 100,000 years ago, a lava flow spawned these odd structures. They’re basalt columns, which themselves are not uncommon. What is relatively uncommon is that each column in the Devils Postpile is hexagonal. There’s a similar formation on the coast of Northern Ireland called the Giant’s Causeway. As the lava cooled, it began to shrink. But the shrinkage led to tension, which led to nascent cracks. These cracks were then burdened with the tension themselves, so they branched off. As it turns out, a 120-degree crack releases the most tension. And 120 degrees just happens to be a hexagon’s interior angle. Had the lava all cooled at exactly the same rate, we would be left with perfect hexagonal columns, but since it did not, we got somewhat hexagonal polygons. But the most obvious natural hexagon is the honeycomb, the geometrically perfect home for bees and their honey. Bees worldwide are extraordinarily adept at constructing uniform hexagons. But beyond that, they themselves are encoded with the shape: the hexagon is written into their eyes. Their hives are wondrous constructions, and their hexagonal nature is part brilliance and part accident. Hexagons appear in honeycombs because they’re the most efficient way to fill a space with the least amount of material. Some shapes tessellate, meaning they can be repeated across a surface without leaving gaps or overlapping. Triangles and squares tessellate; circles and pentagons do not. Hexagons, which are themselves composed of tessellated triangles, do. Tessellation ensures that there’s neither wasted space nor wasted energy. For millennia, scientists assumed that it was the most efficient way to fill a plane, but it took until 1999 for someone to prove it: Thomas C. Hales, with his “The Honeycomb Conjecture.” Bees figured it out long ago, and it’s a good thing, too: beeswax, because it is hard for bees to produce, is precious. Efficiency is paramount. But you can also imagine trying to pack a bunch of malleable circles into a flat, square plane. After a while, you’re going to run out of space. But there will be one perfect moment at which the circles both do not overlap and fill all the space. When this happens, the circles will all have become hexagons. Beeswax is likewise malleable, and this is essentially how honeycomb takes on its form. There’s a whole family of crystals that are hexagonal. Snowflakes are hexagonal. Both become macroscopic hexagons because their microscopic, molecular structures dictate that they become hexagons. And any student of science will be quick to point to the skeletal formula: We represent organic compounds with hexagons. Most organic compounds have carbon backbones, as carbon is superabundant and bonds well with other elements. When one carbon atom bonds with another carbon atom, the bond angle is less 120 degrees. But when six carbon atoms bond — due to electron pair repulsion and some other stuff — it’s an even 120. 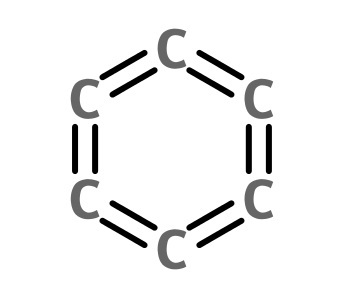 As a result, six bonded carbons — benzene — make a perfect hexagon, also known as a benzene ring. So hexagons are all over the place in nature, from the biggest planets all the way down to microscopic compounds. We have pretty reasonable scientific explanations for all such hexagonal appearances. But whether you find your gods in heavens, in science, or in hexagons themselves, you can still be wowed by their efficient recurrence.